In herbal medicine we use the leaves of Wormwood, a tough and long-lived plant that has an intense (actually rather pleasant) odour and a truly unforgettable taste. 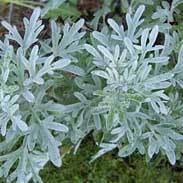 The whole Wormwood plant has an unusual grey-white colour and is covered with a soft downy kind of fur. 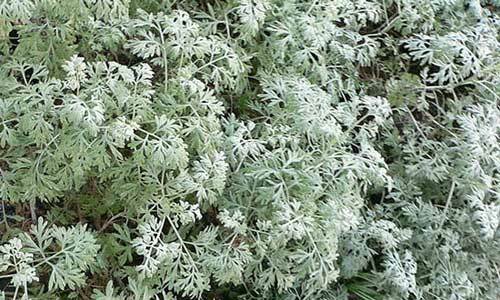 Wormwood looks weird, it tastes weird and its name could hardly be less appealing but this is a plant with a tremendous medical history and one that is still revered in herbal traditions today. Wormwood has also been highly regarded as a pain-relieving herb when applied externally as a tincture rubbed on the skin or a compress made from the herb and placed over the affected parts. The British Herbal Pharmacopoeia (BHP) describes Wormwood's actions as bitter, stomachic, choleretic, anthelmintic and says it is indicated for parasitic infestation, anorexia, atonic dyspepsia and specifically indicated for infestation with Enterobius. 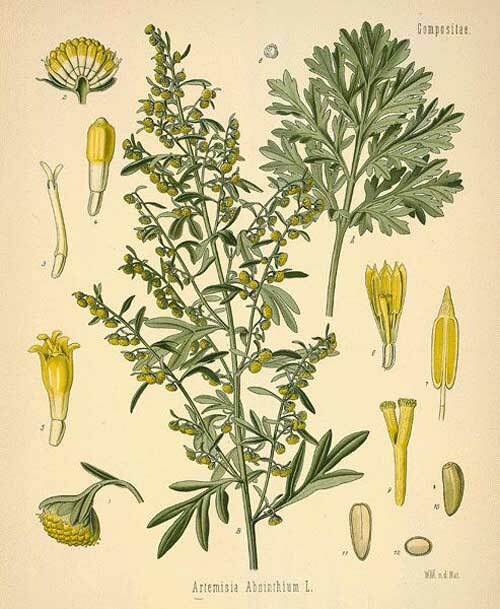 The BHP suggests a dose of 1-2 gms or by infusion or a dose of 1-2mls of the extract of Wormwood. Thomas Bartram describes Wormwood's actions as a digestive, mental, stomach, bile and gastric juice stimulant. 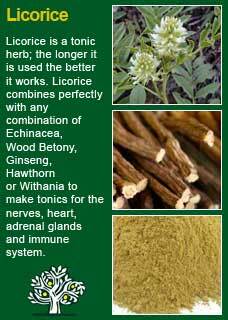 Antiparasitic, anthelmentic, anti-inflammatory, carminative, choleretic and immune enhancing herb. 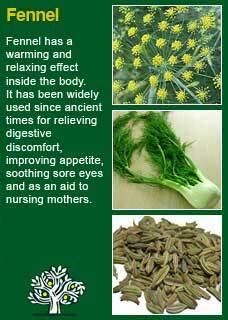 He says it can help 'feeble digestion, liver & gall bladder congestion with yellow tinge of the skin and eyes'. He goes on to say that 'Wormwood is also for depression of liver origin, foul breath, lack of appetite, nausea and travel sickness'. ~ Texts written 2 thousand years ago in China describe how to use Wormwood to treat Malaria and in recent years one of the active ingredients of Wormwood, Artemesinin, has indeed been shown to be a staunch ally against this dreadful disease. Malaria kills over a million people a year, most of them children and especially in Africa. In 2004 the Ethiopian government changed their front line Malaria drug from Fansidar, which had an average treatment failure of 36% to Coartem, a drug based on Artemesisin, which is 100% effective when used correctly. 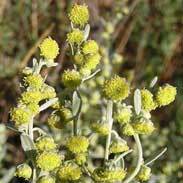 Wormwood should not be used by pregnant women or during breastfeeding; I would not use this herb for children under the age of 12 unless other methods had failed. It is safe to use for the elderly when needed but the dose should be moderate. As a member of the Compositae family there is about a 1% chance of being mildly allergic to it. 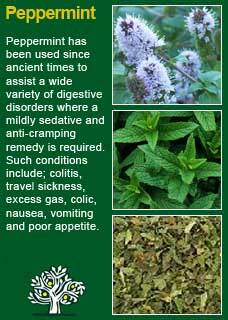 Symptoms such as a cough, itching after commencing its use mean it is not the herb for you. 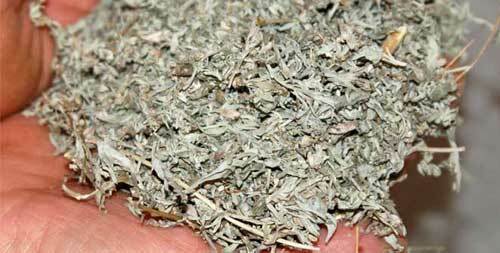 Increased bowel cleansing is common from using Wormwood and is not seen as a bad sign. There are plenty of reports in the medical literature of severe toxicity from the excessive use of Wormwood or one of its derivatives. Wormwood was the basis of the infamous absinthe that is thought to have sent Van Gogh, along with many others, quite mad. This is a herb to use with much care, the right amount can be a healing medicine even when other methods have been unsuccessful but too much will be a poison. Use with care. 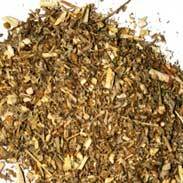 Wormwood is a potent cleansing and stimulating herb that does its work within the body for a long time after it has been taken. It is a herb to use with much respect and not for longer than required and I usually prescribe it to be taken once a day, with plenty of water, and away from food. I look for signs of encumbrance and excess dampness as an indicator to using Wormwood; such things as a thick coating on the tongue, a languid pulse or debris and congestion in the blood plasma. Symptoms that might suggest the use of Wormwood include bloating and distension in their abdomen, headaches, tiredness, and low grade inflammation in the back or the joints. I see Wormwood as one of the best of all medicines where there is dysbiosis; infection in the digestive tract. This may be obvious from the health history or in symptoms such as grinding of the teeth, an itchy bottom or a chronic bloating of the gut that is not simply related to food intake. In the olden days such symptoms would have been thought to have been caused by worms but we now know that bad bacteria and fungal overgrowths are even more common than parasites -- fortunately Wormwood pretty much kills anything you don't want in there if you take enough of it for long enough! The tincture of Wormwood is very effective but is hard to take because of its extreme bitterness. Nevertheless is someone has a congested liver or a blocked flow of bile a one-off dose of the tincture -- whereby around 10-20 drops in a glass of water is drunk over a few minutes -- is a remarkably potent and quick acting treatment. For the effective treatment of gut parasites or fungal or bacterial infection I prefer the ease of use of the capsules of Wormwood whereby I typically give a strong dose of around 4 x 400mg capsules in the evening for as long as it takes to effect a cure. Much of the information here about the traditional uses of Wormwood is consistent with the model of thinking whereby one may treat problem A with herb B. There is value in this approach in how it helps us pass on useful knowledge to one another but where it falls short is that people are not all cut from the same cloth! 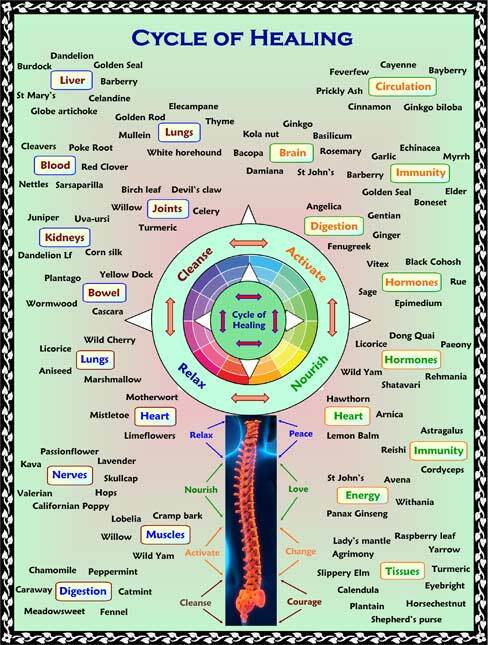 Wormwood might work brilliantly for one person but less well for another with the same sort of symptoms -- why is this?